One thing that’s so often frustrating with games is the refusal to play up to the strengths of the medium. We’re bogged down with trying to replicate reality down to the smallest, infinitesimal detail that we forget that we have this huge power to play with. We can create anything, and yet, for the most part, this is ignored. It’s all about getting the grime of an assault rifle right, or making sure that that burned out chassis of a car is rusted in the right parts. That has its place, but it seems that things have gone too far, that there isn’t enough people really pushing things. 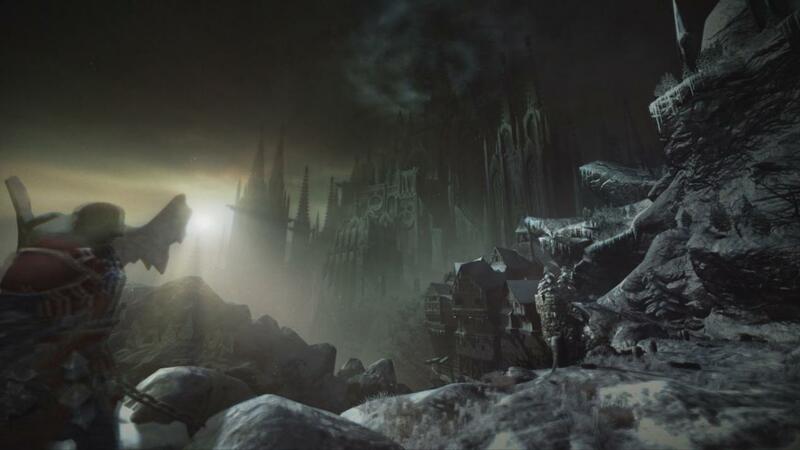 Look at that image above; it’s concept art, sure, but look at not only the size of that castle, but the complex nature of it. Imagine that in a game. Imagine having to scale its towers, explore the vast halls, its gargantuan throne rooms. Exciting, yeah? I’ve been working my way through Castlevania: Lords of Shadow over the past week or so, and beyond the solid combat and consistently excellent voicework from Robert Carlyle and Patrick Stewart, the thing that’s most been sticking with me is the sheer beauty of the game. It takes the macro ideas of God of War and runs with them, forcing them into a Gothic, medieval setting and pushing it further, into something that’s consistently awe inspiring. That castle is just one section of a game filled with so much variety it’s almost too much to keep up with. You start in Teutonic forests, before making your way into vast, ruined cities, seeming to take their inspiration from middle eastern empires. Jerusalem, Persia, the influences are muddied but still clear. A veritable visual feast. But it’s the scale that sticks with me, that these places are so vast, and intentionally confusing, that quite often navigating them is a mixture of impressive directional nous, and vertigo-inducing platforming. I’m currently navigating my way through what is called the ‘Titan Graveyard’, a poisonous smog-filled desert littered with the detritus of giant, stone golems. They’ve just about retained enough form to remain recognisable as vaguely humanoid, but for the most part it’s just the suggestion of a face, and only then after you’ve been climbing all over it for a few minutes. Impressive stuff. That’s Guild Wars 2. And that’s in game. I’m so, so happy that ArenaNet have actually started making the stunning concept art of Daniel Dociu a reality, or at least a virtual reality. Just look at the size of that fortress; no such thing could exist in real life, and even a film would struggle to replicate the sheer scale of the thing without resorting to miniature or CGI, and even then it’s hardly like it would be completely synonymous with the rest of the world. There’s always a little suspension of disbelief with such effects. With a game world, you’re free to make it as outlandish as you like, because the whole thing is rendered in the same engine. It’s an interesting comparison to make, really. Games aren’t all that like films, at least live action ones, at least in terms of production. They have far more in common with animation, where the world is created by artists and designers, each part of it conjured up rather than placed there. There’s a reason that animation so often concerns itself with the impossible or the fantastical; live action can’t go to these places, and so animation has a monopoly on it. Howl’s Moving Castle, Wall-E, even something that wouldn’t be too difficult to recreate, like Up!, lends itself to animation purely because of the impression and feel that the style puts forward. But let’s not limit ourselves to fantasy. There’s always this. 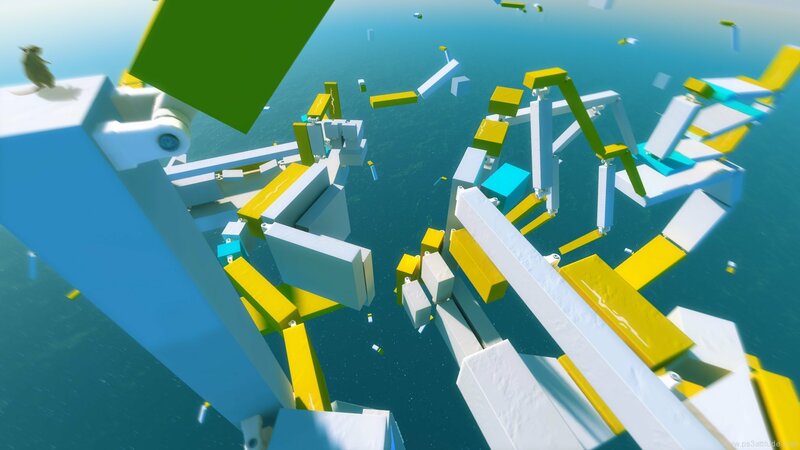 My favourite part of that image is that the impossibly suspended bits of free-running obstacles are attached together like hinges. Like the designers figured that if they were all suspended separate from one another, that’d be a step too far for the player. It’s adorable. But really, that’s a glorious example of a level artist free from restrictions, even the somewhat loose restrictions of Mirror’s Edge’s world, which was highly stylised in the first place. Now, they’re allowed to just go nuts, creating something that could never exist, and doesn’t even need to make sense. It’s made purely to be played, devoid of story or context, just there, glorious in its isolation. It doesn’t matter how you take it; it doesn’t really care about what you think, just what you can do. Think you can complete the level? Then do it, suspended in the aether, with nothing at all in any direction. Just you and this assortment of impossible blocks. Which, inevitably, leads you towards something like this. 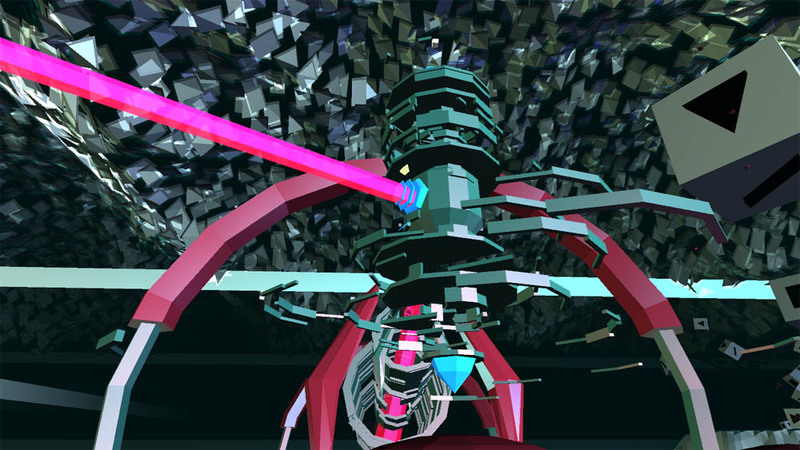 That’s Fract, a music inspired first person puzzle game from Richard E Flanagan, and it’s more of a visual tour de force than anything else. The integration of music and visuals is powerful regardless, but it’s the levels themselves, and they way they coalesce and pulse that is most striking. It’s obviously inspired by Mendlebrot and the fractals he was so famous for, but it’s certainly its own thing. So that’s what I’m after. I’m after developers slipping free of the shackles of reality, and creating something a little more impossible. Because this is escapism, and I’d rather not spend 90% of my gaming life escaping to a war zone. Why not come up with something a little more creative, a little more imaginative, and little less slavishly attentive to recreating the intricacies of our world, and instead set about creating one of your own? I've graduated, had a look at the world, and spat. Now I'm devoting my time to moving from 3/4 of a games journalist to 9/10ths. I figure I can get away with 9/10ths. This entry was posted in Games, OneADay. Bookmark the permalink. I’m glad that you mentioned Guild Wars 2. Games are placing too much emphasis on the minutae, and within context, that’s fine. 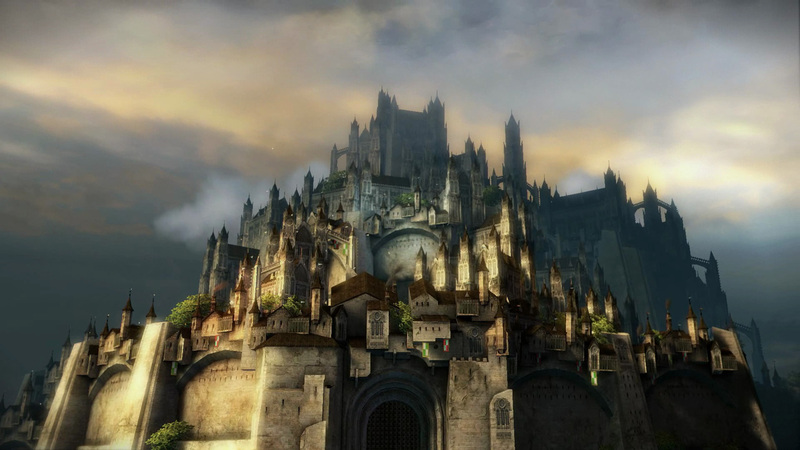 However, Guild Wars 2 reminds me of Shadow of the Colossus in a way; both rely on monstrous, intricate environments, yet they always manage to capture interesting detail within their relative scale. Even though Shadow of the Colossus was largely empty, it felt like a world that once existed at some stage in time, and its state on scale really reflects its condition. Also, for surreal-cred, you totally should have mentioned the Polyhedron from Pathologic.